This image was staged and taken during a workshop with Boris Eldagsen: Hijacking Reality. In our last assignment Boris would have us choose between ‘heaven’ or ‘hell’ (or both of it or anything in between). Feeling inclined to hell more than to heaven, our subgroup felt that the beautiful staircase in the entrance hall of Kunstquartier Bethanien, a former deaconess institute founded by Prussian King Friedrich Wilhelm IV, wouldn’t fit our hellish needs. 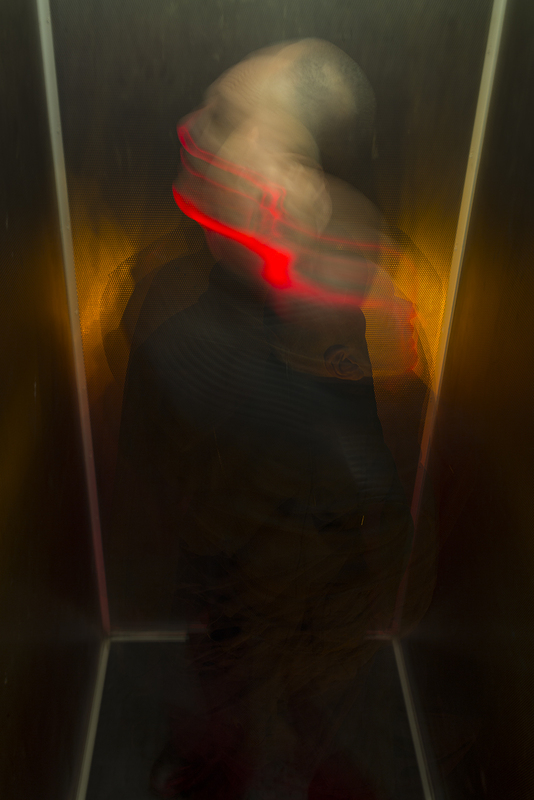 Instead, we decided to turn to the three-dimensional grid of a somewhat claustrophic elevator. The photograph was co-produced with Boris Eldagsen (slumping down the elevator over and over again), Cameron Scott (adding light effects with flash and colored foil), Nadine Stelzer (observing the process and gently giving stage directions), and myself as your photographer.